Stainless steel hardware for railings & stairs, imported, covering a wide variety of aesthetic, fuctional and economic requirements of individual customers. Stainless steel is a fadeless material that withstands all weather conditions without eroded or changing it's occurence over time. 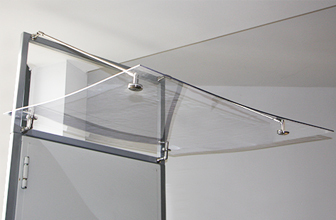 The assembling of the inox banisters can be easily made from the customer himself , giving him the opportunity to have low cost and high style.